Always available: Comprehensive DNS management for all AC.UK domain names we manage for no additional cost. All we charge for is the domain registration renewal. Register one of the most trusted and credible domains in the World: a .AC.UK domain name. Many academic establishments funded by the UK Government can use and benefit from a .ac.uk domain name for their website like nhamusic.ac.uk have. Find out how to register a .ac.uk domain now. FREE DNS hosting, and free web hosting for the first year worth . 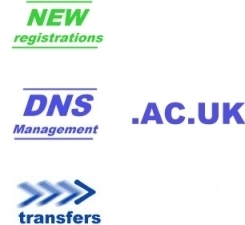 Check the whois and DNS records in seconds for any ac.uk domain. We also provide GOV.UK hosting which provides free .gov.uk DNS management.